The kitchen…The center of the home universe..your meeting ground…your ground zero. 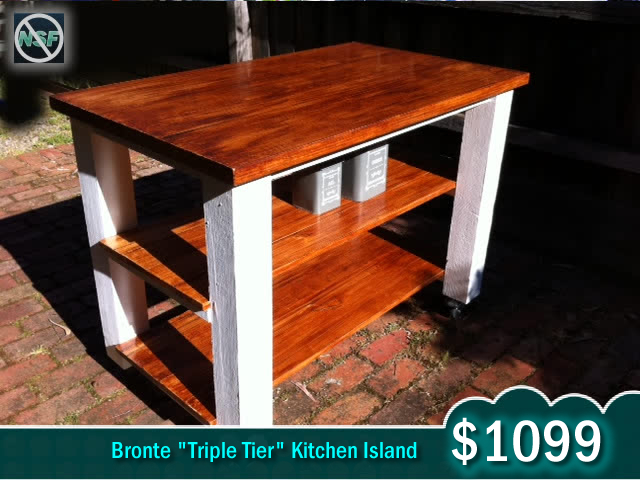 to bring your boring kitchen back from the dark ages and get it’s kick on. Have an idea or want to mix and match styles? No problem. That’s what custom made is all about. You can place your order and have your kitchen buzzing again in 10-14 business days after your deposit is made. Call us today and we will sort you right out with what you need. by the distressed “Bronte Chic” look that you have grown to love. Size is 1.2 m by 60 cm wide by 90 cm high. Add $75 dollars for castor wheels installed for easy movement. Larger sizes can be ordered for an additional charge. Three tiers of love. Solid Victorian Ash hardwood top and two levels below are enhanced with a beautiful mahogany stain and finish solid hardwood top and below on both levels. These legs are solid but can be made to our own natural bronte chic standards. Size is as follows 1.2 m long by 60 cm wide by 90 cm high w/ castors for easy movement. Enjoy your meal or drink on one side and have room for all your storage on the other. 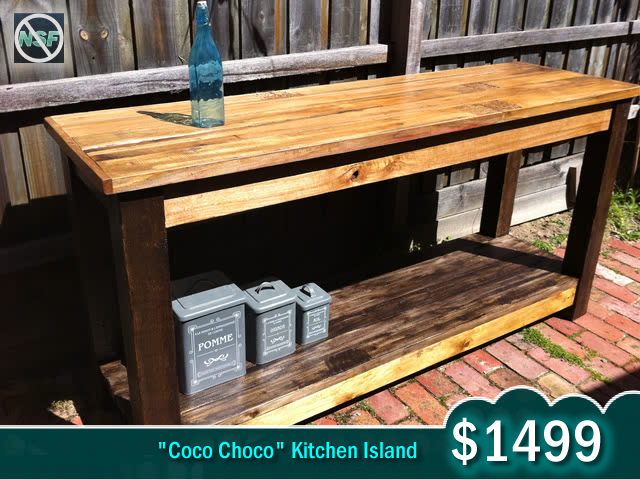 A great island and storage solution for small spaces. Solid Victorian Ash hardwood top and two levels below. 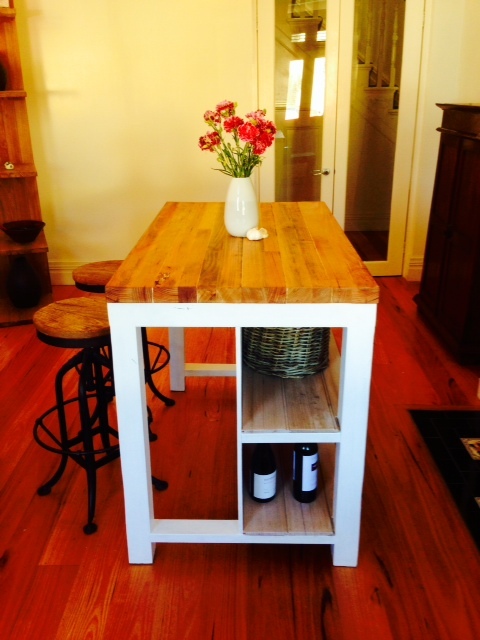 The top is enhanced with a natural finish solid hardwood top and and a white wash on the hardwood shelves. 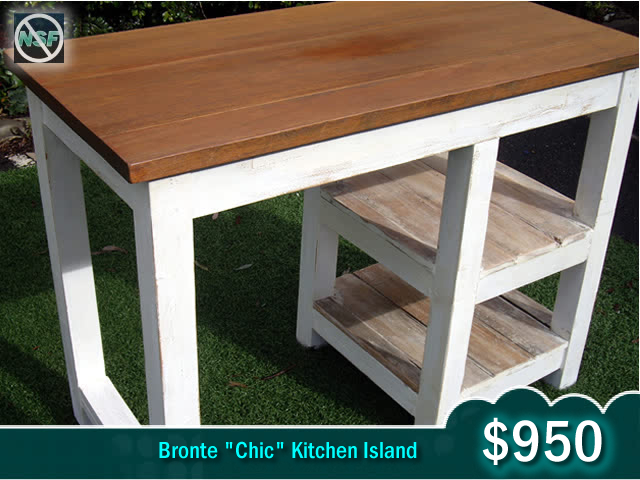 These legs are solid white but can be made to our own natural Bronte chic standards.